Should a child blog under their real name or not? If you are starting a blog, should you put your real name on it or not? Nine year old Mr Turtle doesn’t have his name on The Turtle of Happiness, whilst 12 year old El from Eljae keeps her real first name tucked away on the ‘About’ page and doesn’t reveal her surname. But other kid bloggers like Tom of The Adventures of SuperTom and Jake of Jake’s Bones do use their first names. I guess there are a lot of Toms and Jakes in the world so they are still keeping their privacy. In the future, someone who’s thinking about giving you a job may google your name – do you want a future employer to see what you were into when you were 12? On the other hand, if you’re blogging about something you’d like to do for a job, your blog could help. Your teachers might find it! Your future kids might find it! What happens if you grow up and do a really important job – will you be embarrassed by your blog? What if you’re trying to impress someone and they pull up a really lame post you wrote when you were 8? How ever you feel about it, discuss your blogging identity with your parents before you start so that you’re both happy with whatever you decide to do. Many adults blog under a false name or anonymously – it’s not necessarily a kid thing. Whilst it can be fun to make some of your life public in a blog, sometimes it’s nice to keep some things just for you. 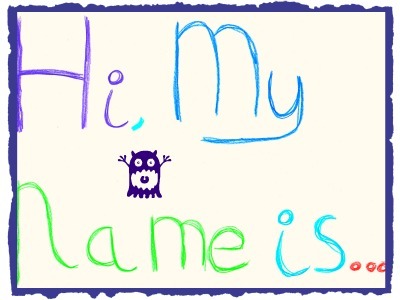 What do you think, should kid bloggers use their real names or not? Tops and BB have two blogs each. They have one under their nicknames (Tops and BB obviously!) and one that is locked down in their real names. The real name ones are open just for family and for them when they are older as I’ve kept them since they were born, a sort of daily journal. The ones in their nicknames are more linked to my AMR and is their view on things and what they’ve been up to. I would have blogged openly under their real names, but my husband felt it was more important to keep some things hidden so that it would be harder to identify them in the future. The thing is though, now both my children are so well known by their nicknames on the web by family, teachers and friends that it’s like using their real names! Maybe they will forget their real names and only answer to Tops and BB forever! Wow, Pippa, you’ve got a LOT of blogs, how do you keep it up? I would not be happy about my children using their proper names ( if my children were children that is). Feel it leaves them open to possible implications both in their future and from evil people now. I have changed the names of my grandchildren for my blog and do not refer to my own adult children by their names either. too easy for people to join them all up and cause hassle online. Thank you for your comment Elaine. It seems a shame that we should be dictated to by nasty people but sometimes it has to be that way. I started by just using my first name and the county where I live. When I started getting featured in newspapers and on TV they use your full name and village (although Autumnwatch didn’t) so it was difficult to keep it secret any more. I have an unusual surname so it’s fairly easy to work out who I am now, but I have never had any bad experiences or anyone try to contact me in a bad way. In fact, one person sent me a tin full of amazing bones using just my name and village after reading about me in a newspaper. Thanks so much for your comment Jake – it’s really interesting to hear about your experiences. I guess that’s what must happen when you’re a famous blogger – everyone knows your name! I am using my real first and last name . I think people should use real names if they are sharing good stuffs.